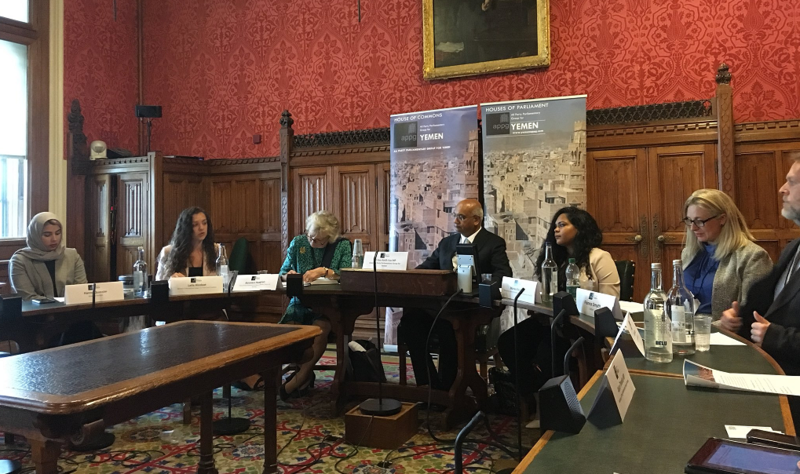 On Wednesday 18 July 2018 the All-Party Parliamentary Group for Yemen and the All-Party Parliamentary Group on Women, Peace and Security co-hosted the event “Women in Yemen’s war”. The panel discussion focused on the gendered impacts of the conflict with particular attention to how women are affected. Areas of discussion included: women’s access to health services; the secondary and tertiary gendered impacts of the use of explosive weapons in populated areas; the resilience of women’s rights organisations operating in conflict-affected contexts; and supporting women’s livelihoods and economic justice in conflict. Baroness Hodgson of Abinger – Co-Chair of the All-Party Parliamentary Group on Women, Peace and Security – and the Rt Hon Keith Vaz MP – Chair of the All-Party Parliamentary Group on Yemen – co-chaired the event. Speakers at the event included: Laurie Lee, Chief Executive of CARE International UK; Laila Alodaat, MENA Director at the Women’s International League for Peace and Freedom; Marwa Baabbad, a Fellow at the LSE Centre for Women, Peace and Security; Fionna Smyth, Head of Humanitarian Policy, Advocacy and Campaigns at Oxfam; and Hanna Quassim, Director of Adalah Yemen.